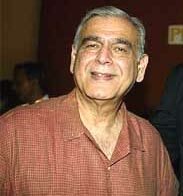 Ismail Merchant was born in Mumbai in 25th December in the year 1935 as Ismail Noormohamed Abdul Reh. In his career spanning three and a half decades, he has made some 40 feature films. Many of them made with the collaboration of his pal, director James Ivory and writer Ruth Prawer Jhabvala. The famous Merchant- Ivory duo has made a mark of their own in the film world. Adaptation of E. M. Forster's 'A room with a view', Kazuo Ishiguro's 'Remains of the Day', 'Rose Land' and 'Heat & Dust' are some of the best Merchant-Ivory movies. Vanessa Redgrave, Isabelle Adjani, Christopher Reeve, Anthony Hopkins, Paul Newman, Emma Thompson, Isabelle Adjani, Paul Newman are a few well known actors who have featured in his films. They all crave to work with him knowing that he will pay them only a little more than his attention. Besides film making, Merchant was also a renowned chef and the author of several books on quality cooking. He passed away at the age of 68. He was unmarried.